The very sweet four-star Apanema Hotel is located only 500 meters from Mykonos Port in the direction of Tourlos Bay, an easy 10-minute walk to town. Opened in 2000, this small and exclusive accommodation features Mykonian architecture and is built along the natural lines of the hillside, set on several levels. The hotel faces the sea and overlooks the fabulous freshwater swimming pool. 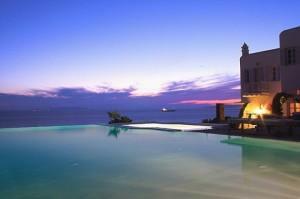 Because of its position, it offers magnificent sunsets and stunning views of the surrounding islands and Mykonos Town. The hotel's 17 rooms and suites are luxuriously furnished and offer partial or full sea view. Each room has individually controlled air conditioning, heating, color TV, DVD player, direct-dial phone, free high speed WI-FI, safe box, mini bar, and a writing desk. On request, it is possible to have a non-smoking room (subject to availability), an additional bed or cot, and an iron with ironing board, all at no extra charge. The hotel has an excellent restaurant offering breakfast, lunch, dinner and room service. Many of the baked goods are homemade, and the freshest ingredients are used in the mainly Mediterranean menu. In addition to the freshwater swimming pool, there is a children's pool/Jacuzzi and a poolside snack bar. The Apanema also provides beach towels, a laundry/pressing service, and twice-daily maid service. On request, babysitting and baby cots, and secretarial services and a PC can also be provided. The hotel also offers private parking. 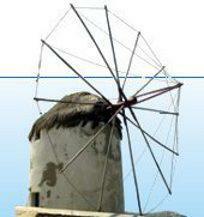 Located 500 meters from Mykonos Town, on the road to Tagoo.